For vote number three, we fates have trickier matter to determine: What task to trust with which character. I can tell you we have only a one-in-eight chance of getting that right. Romeo resists. Mercutio and Benvolio try to convince him to join them at Capulet's party, but "My mind misgives," Romeo says. "Some consequence yet hanging in the stars shall bitterly begin his fearful date with this night's revels and expire the term of a despisèd life closed in my breast by some vile forfeit of untimely death." "Or not," replies Mercutio. "I mean, you don't know that." Romeo ponders this a moment. "I suppose it depends on whether or not people make terrible decisions," Romeo says. Tybalt (Jack D. Martin) addresses Juliet (Ella Smith) as Benvolio (Sam Plattus) hides in Valley Shakespeare Festival's production of Romeo and Juliet, Choose Your Own Ending, an adaptation of William Shakespeare's play by Ann Fraistat and Shawn Fraistat at Tavern 1757. Photo by Kayleih Mihalko, Valley Shakespeare Festival. He doesn't mean his decisions; he means ours, those made by the audience at this Valley Shakespeare Festival production of Romeo and Juliet: Choose Your Own Ending, the cleverly comic adaptation of William Shakespeare's tragedy by the sister-and-brother writing team Ann and Shawn Fraistat. The play pauses at three points for the audience to vote on a decision Romeo must make, leading to eight different endings, ranging from the standard Romeo and Juliet dying to just Benvolio dying (but not quite dead yet), to nobody dying, to everybody dying. The Fraistats start with Shakespeare's text and mix in verses from his other plays and sonnets plus many of their own lines, including liberal use of mature language and sexual connotations, to create cheeky internal commentary on the play itself. In other words, it's a perfect piece to play in a bar, which is the venue for this production: the upstairs banquet room (with its own bar) at Tavern 1757 in Seymour, Connecticut. 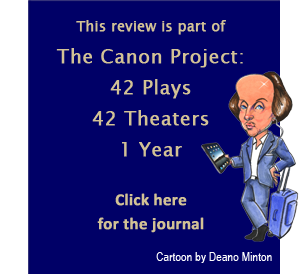 Members of this six-person cast plus Director Tom Simonetti, Valley Shakespeare Festival's artistic director, contend that taverns are the right setting for any and all Shakespeare plays, be they quirky adaptations or original texts. Valley Shakespeare Festival, founded in 2013 in Shelton, Connecticut, stages free Shakespeare in a city park in the summers and tours to area schools, senior citizen centers, and homeless shelters throughout the year. The company also has staged several Shakespeare plays in bars, including The Merry Wives of Windsor (think about that: Falstaff standing at the bar as he describes being carried in a buck basket of greasy clothes and dumped in the river) and Titus Andronicus (think about that: Lavinia with bloody stumps where her hands should be, wandering among the tables of patrons, and I won’t even mention the meat pies—oops). For this one-night-only performance of Romeo and Juliet: Choose Your Own Ending, the cast has had only 2 1/2 days of rehearsal. The play runs just over an hour, but the actors had to work through all eight tracks, not knowing which ending the audience would send them to. Every actor except Ella Smith playing Juliet has scripts in hand, but without this visual clue you wouldn't know that any are not off-book: The dialogue runs smoothly, the pace is quick, and the actors, wearing everyday clothes from their own wardrobes, are fully immersed in their characters. This is true even when they directly address the audience, either with ad libs (Jeremy Funke playing Mercutio switches out "lawyer" for "architect" during the Queen Mab speech to reference a member of the audience) or in scripted moments. The characters don't let the audience forget its grave responsibility, starting with Romeo's comment in that first scene about people making terrible mistakes. At one point, Rosaline (Jessica Breda) comments that she has a one-in-four chance that she'll kill herself. "One in four?" Juliet asks. "One in four," Rosaline replies, Breda pointing around to the audience. She becomes more urgent in a later scene when she says, "If this keeps up, I might just kill myself." "Odds?" asks Romeo (Killian Meehan). "Now it's one in two," Rosaline replies, and, with a glare to the audience, Breda continues the line, "Don't f*** this up." Such self-awareness fuels the comedy of the script, starting with the choose-your-own-ending premise. A key theme of Shakespeare's Romeo and Juliet is the intersection of fate and choices. The play's plot advances by the decisions characters make (Romeo hitting on Juliet, the friar deciding to keep their marriage secret), by incidents of fate (the plague preventing the message of Juliet's feigned death from reaching Romeo), and by what seems to be preordained developments (the confrontation between Tybalt and Romeo leading to Tybalt killing Mercutio leading to Romeo killing Tybalt leading to Romeo shouting "O, I am fortune's fool!"). True, that preordination is built by a series of human decisions, but it's all predicated on a conditioning context, the Capulet-Montague feud, albeit its origins and perpetuation stem from human decisions. In the Fraistats’ adaptation, the audience plays the fates, and the characters are at our mercy—for the most part. The attention-deficit-afflicted Mercutio ("O my God, air has a taste!") keeps forgetting his tasks. The batty nurse (also played by Funke) “was only joking” when he told Benvolio (Sam Plattus) he should kill himself. The egotistical Tybalt (Jack D. Martin) can sniff out a Montague in the garden. The clueless Benvolio is a turbine of teen-age angst. The romance-addled Juliet falls in love with anybody who speaks poetry to her. So, for sure, psychological makeup has a lot to do with the destinies of these characters, no matter what fates we decree for them. This duality evolves through the sequence of decision points. Number one is whether Romeo should stick with Rosaline or approach Juliet (depending on that decision, Rosaline becomes a major character). Number two is how Romeo should respond as Tybalt starts to brawl with one or another Montague. For vote number three, we fates have trickier matter to determine: What task to trust with which character. I can tell you we have only a one-in-eight chance of getting that right. No matter the track, you’ll be laughing. Some of the play's humor comes from the Fraistats adding modern sentiments to the play's poetic DNA. Nurse, with Funke speaking like a Southern debutante on a hot tin roof, identifies Juliet to Romeo or Benvolio (depending on the track) with "Marry, bachelor, her mother is the lady of the house, and a good lady, and a wise and virtuous. I nursed her daughter that you talked withal. So whate're you're thinking, Montague, hands off!" Funke switching to a man's baritone for that final warning shot before curtsying demurely. The play's irreverence announces itself just a few lines in when Romeo sees Benvolio sneaking through the audience. "Was it my father that sent thee hither in such awful haste?" Romeo asks. "Nay," Benvolio replies, "'twas [really vulgar incestuous adjective] Tybalt. I spake of peace, but Tybalt hates the word." Tybalt hates all words. Even in the most tragic but hilarious of the eight finales, the one where this evening’s show ends up, after Romeo and Benvolio have poisoned themselves seeing the dead-like girls, and after Juliet and Rosaline fatally stab themselves upon seeing the actually dead boys, Tybalt and Mercutio arrive, start arguing over trivialities, and stab each other in a snit. As they fall to the floor, Mercutio tells Tybalt he’ll see him in hell. “Hell!” Tybalt yells; “I hate the word as I hate hell, all Montagues, and thee.” Mercutio wonders if there are any words Tybalt doesn’t hate, and the fiery Capulet offers one: “flurple.” As the dying antagonists argue whether flurple is a color and threaten to kill each other double, Chorus (Simonetti) enters to speak the epilogue, barely audible over the 80-patron audience's laughter. I’m not really spoiling the ending here, by the way; remember, this is just one of eight endings—the spoiler would be in revealing how we got here. (Yes, this is Sonnet 18, not Romeo and Juliet.) Romeo pauses in thought. "Perchance, she shall notice that temperate and date don't rhyme," he says. He rewrites it so that date rhymes with a line about her weight. Romeo later is shocked to learn that Rosaline is a Capulet. "There's one line where Shakespeare just kind of slips that in there," Mercutio explains to the audience. "Is it possible?" says Romeo. "I mean, you'd think that would have come up as an issue before, right?" "So thou wouldst think," replies Mercutio. "But for some reason, it totally didn't." The Fraistats up the ante by making Rosaline Tybalt's sister: "We added that part," Benvolio tells the audience. After Tybalt has locked away Rosaline and Juliet, Romeo and Benvolio with Mercutio go to Capulet's garden, but have no idea how to get to the girls. "How did you guys manage this before?" Mercutio asks. "Most often, they're already outside," says Romeo; "Talking about us loudly," adds Benvolio. Then there is the feud itself: The Montagues and Tybalt can't remember its initial point of contention, making even Mercutio incredulous. "I think 'twas something about whether sporks are more spoons or more forks," recalls Tybalt, and though both Romeo and Benvolio nod in agreement, Martin's Tybalt shouts, "Whatever it was, they started it!" One of the most subtle set pieces comes when Romeo's pursuit of Rosaline opens the way for Benvolio to hit on Juliet. After failing with "Rub a dub, dub, it's time for some love," Benvolio cribs from Romeo's pickup line: "If I profane with my unworthiest hand this holy shrine, the gentle sin is this: My lips, two blushing pilgrims, ready stand to smooth that rough touch with a tender kiss." He's kicked off the love sonnet of Romeo’s and Juliet's famous first meeting; except that's the only part Benvolio has overheard Romeo use, and as Juliet takes over the whole sonnet, Benvolio can only interject the observation that "Prayer is important" and ends in confusion: "Wait, I'm sorry, lips are doing what now?" forcing Juliet to "show thee" what lips can do. Meanwhile, Romeo still pursuing Rosaline leads to another of the original play's famous episodes getting a work-over, Juliet's opening monologue in the balcony scene, "O Romeo, Romeo! Wherefore art thou Romeo?" In this track, Romeo gives Rosaline the same setup, but her opening line is "O men, men! Wherefore are men men?" (Audiences who vote into the Juliet track have their fun, too; Juliet speaks her famous monologue, but when Romeo announces his presence, she whips out a crossbow and aims it at him.) The proof that Rosaline has actually fallen in love comes when she starts speaking in rhyming couplets. Even when, disguised as a man to determine Romeo's sincerity—of course; she's Rosaline, and Romeo addresses her as "unsuspiciously attractive stranger"— Rosaline rhymes "maid" with "laid." Killian Meehan prepares to play Romeo in the Valley Shakespeare Festival's production of Romeo and Juliet: Choose Your Own Ending at Tavern 1757. Photo by Eric Minton. Despite the winking nature of the script, the actors play it all with straight sincerity, albeit slightly over the top given the environment—they are in a bar packed with people eating and drinking and one nervous service dog. Highlighting any performance might seem like slighting others—each member turns in solid character studies in their performances—but Funke in particular has the perfect skill sets for the play's and venue's atmosphere. Wearing a t-shirt emblazoned with "I drink and I know things," he plays Mercutio as such a charming jerk he creates something of a cult following in the audience, and his rump-chasing Nurse, wearing a quickly-doffed old dress and curly blond wig, defies description. Martin, meanwhile, achieves true artistry as both the arrogant-yet-shallow Tybalt and the preening Paris, the latter donning an Elvis-like wig and constantly posing as he name-drops muscle-toning exercises, matter-of-factly describes the effect his sculpted body has on women, and hands Juliet a portrait of his abs. The actors also work the crowd, prodding interactions with audience members, including one elderly lady who responds to a direct-address from Funke’s Mercutio with the same affinity for vulgarity as the play's characters have. Leading the charge, literally and dramatically, is Meehan's Romeo. While the other five cast members are professional, New York-based actors, Meehan is a 16-year-old local boy who has been performing in theater only three years. Just the day before this evening's performance, he had his first-ever stage combat lesson (thanks to the audience's decisions, he doesn't have to apply that new knowledge in the show). Yet, he more than holds his own with his professional castmates. 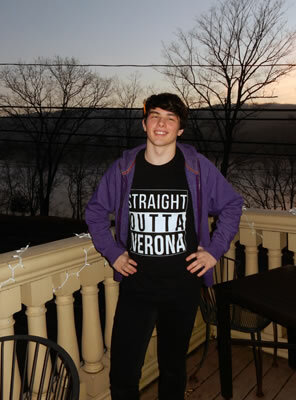 Romeo is the foundation on which this adaptation is built, and Meehan, wearing his own “Straight Outta Verona” t-shirt, captures the character's romantic and social naiveté while serving as a reliable straight-man for the rest, setting up the jokes or landing punch lines with seamless timing. “Two households, both alike in dignity,” Simonetti’s Chorus starts the Prologue (after Simonetti as director warns anyone sensitive to foul language or Shakespearean satire to brace themselves). By the time he speaks the same line at the start of his Epilogue, we know it’s a mischaracterization. The Epilogue ends, though, with an absolute fact. “Thou hast seen the ending that thou has chose; but what thou mightst have seen, God only knows,” except he replaces the deity with the same sexual imagery oft-used in this script—a word that serves as noun, pronoun, verb, adverb, adjective, exclamation, and, as in this instance, interjection. The two houses may be stripped of their dignity in the Fraistats’ version, but not Shakespeare’s play itself. This razor-sharp satire enhances our own insights and appreciation for Romeo and Juliet, especially as played by this Shakespeare-savvy cast (including high schooler Meehan) under Simonetti's direction. I'll drink to that anytime.